The Countess of Wessex visited the studio behind the BFG Dream Jar sculptures soon to be seen around the UK. 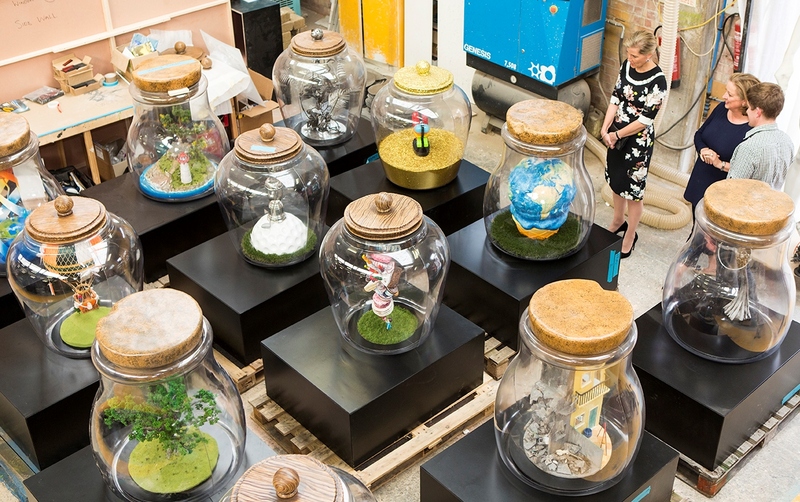 A new public art installation called The BFG Dream Jar Trail is launching in partnership with Unilever across the UK from today. The unique trail has seen the childhood dreams and aspirations of 50 celebrated famous people transformed into sculptures by talented artists. The whimsical sculptures have been placed in giant Dream Jars up to six feet tall to form an art trail in London and across the UK. The Countess of Wessex and The Duchess of Cornwall have both created jars. The Countess of Wessex's jar will be positioned outside The Queen's Gallery in London from 19 July - 31 August. Her dream is 'to protect children from being exploited via the internet' and has been visualised by the artist Ryan Mc Elhinney. The Duchess of Cornwall's jar will be positioned in St James's Park. The Duchess' dream is that every child learns to read and discovers the lifelong pleasure of books. The Countess of Wessex saw the latest progress on her Dream Jar this week when she visited the studio 3D Eye Limited and met the artist Ryan Mc Elhinney.